Garden vegetable cream cheese spread gives this ham-topped bagel its creamy veggie appeal. A little lettuce, tomato and cheddar never hurt, either. Spread bagel halves evenly with cream cheese spread. 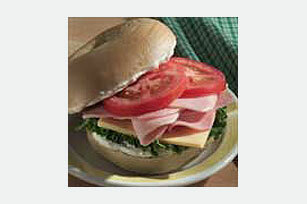 Cover 1 bagel half with cheddar cheese, lettuce, ham and tomatoes; top with remaining bagel half.